Researchers say orca K25, who showed signs of weight loss in the fall, does not seem to have worsened in condition and may even be getting better. An orca that appeared to be losing weight last fall doesn’t seem to have deteriorated in condition and may have even improved, according to the Center for Whale Research. Orca K25, a 28-year-old male, was spotted Saturday afternoon south of Trial Island with the K pod. The orca was seen surfacing from a long dive and appeared to be foraging. “It is too early to say whether he will survive this latest health scare but it is encouraging that he has not deteriorated further since looking pretty bad back in September and may have actually improved some,” the Center for Whale Research wrote in a blog post. It was the first time since mid-October researchers were able to get close enough to document K25’s health. Researchers noted K25 didn’t look completely healthy, but he had not worsened much since October 12. 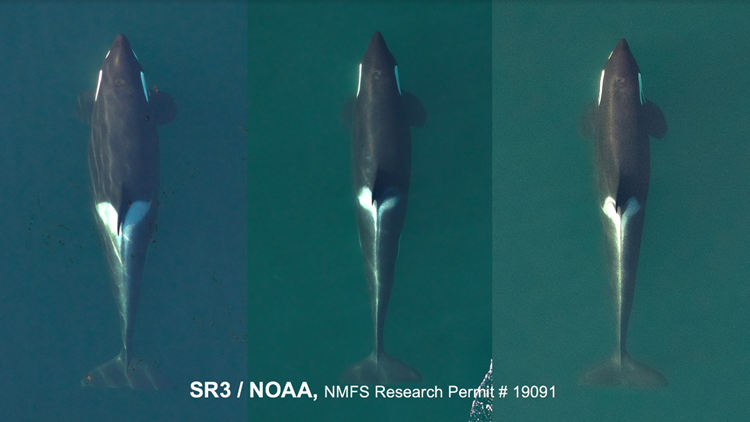 Images show orca K25 appears to have lost weight from September 2017 to September 2018, indicating he may be declining in health. The orca is one of several Southern Residents that orca advocates are concerned about. J17, a 42-year-old female, has peanut head – a depression at the base of the skull that indicates severe malnutrition and fat loss. Center for Whale Research Director Ken Balcomb said several weeks ago she may be near death. If J17 dies, researchers worry her son J44 won’t survive much longer either, because there’s a three times greater chance a male orca dies after his mom does. Ailing orca J50 disappeared from her pod in September after months of failing health, including indications of peanut head as well.